Satoru Iwata, President, Nintendo Co., Ltd. In 2002, Satoru Iwata was named president of Nintendo Co., Ltd. He joined Nintendo in 2000 as the head of the Corporate Planning Division, where he was responsible for Nintendo’s global corporate planning. 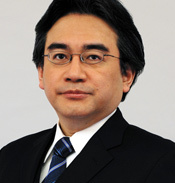 Iwata was born in 1959 in the Hokkaido Prefecture of Japan. He studied at and graduated from the Tokyo Institute of Technology University, where he majored in computer science. Shortly after graduating, Iwata joined HAL Laboratory, Inc. and in 1983 began coordinating the software production and development of Nintendo titles, such as the Kirby series. By 1993, he had become president of that company.